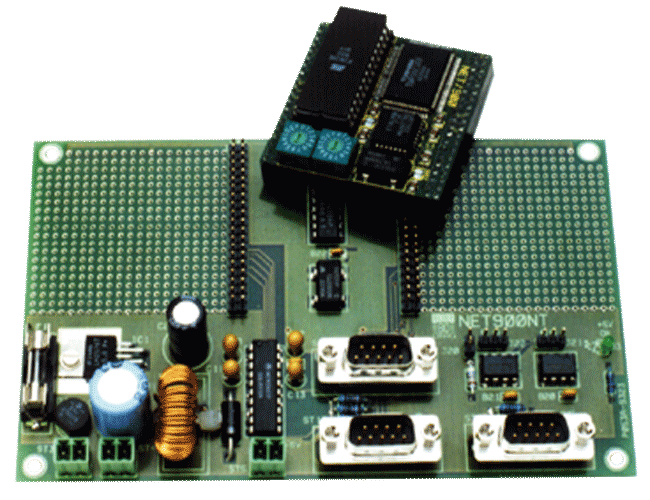 NET900NT provides power and drivers for the serial lines. All other I/O is left to the user on its large breadboarding area. Those who want to start from scratch still need power and a debugging possibility. This is the domain of NET900NT. The switchmode power supply delivers 5V from an 12..30V DC or 10..24V AC source. So any standard 12V or 24V transformer or DC supply will do. The serial lines are available on 9-pin D-plugs with AT-like pinout. SER1 has handshake signals P37 as CTS and SCLK1 as RTS. 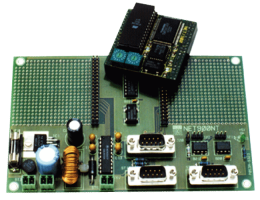 A fixed active polarity of 10V is provided on DCD as soon as NET900NT is powered on. SER0 has only transmit and receive data RS232- buffered and provides RTS and DCD as fixed active levels. The IUSC is coupled to RS485 drivers. To allow both half duplex (transmit and receive data on the same signal pair) and full duplex operation, some jumpers are available to switch modes. If the separate receiver line is not used, it will send the status of RTS (P7/TxCP) to the bus to allow external repeaters (amplifiers) for example for BITBUS. The RS485 circuit on NET900NT is not isolated from NET/900H as for example on EVA900. For BITBUS operation with the IUSC, a 12 MHz crystal oscillator is provided.